This is a small opportunity that's not suitable for everyone, but it has significant upside if recent activists get their way and could be interesting as a small addition to an NOL shell basket. Sycamore Networks (OTC: SCMR) is a former dot-com optical networking darling that at one point was valued at $44.8B before the bottom fell out as late 90s internet traffic estimates ended up being wildly optimistic. In 2013, the company sold the last of its operating businesses, shareholders voted to dissolve the company and commenced a liquidation. Today, Sycamore's market capitalization hovers around $15MM. Sycamore uses liquidation accounting and estimates the potential payout to investors each quarter. The main sticking point to wrapping up the company is the 102 acres they own in Tyngsborough, MA that's under contract but the closing date keeps getting pushed back. As of July 31, 2014, the Company had federal and state net operating loss ("NOL") carryforwards of approximately $856.46 million and $34.9 million, respectively. The federal and state net operating loss carryforwards will expire at various dates through 2034. The Company also has federal and state research and development credit carryforwards of approximately $11.31 million and $9.98 million, respectively, which begin to expire in 2020 and 2015, respectively. The occurrence of ownership changes, as defined in Section 382 of the Internal Revenue Code of 1986, as amended (the "Code"), is not controlled by the Company, and could significantly limit the amount of net operating loss carryforwards and research and development credits that can be utilized annually to offset future taxable income. 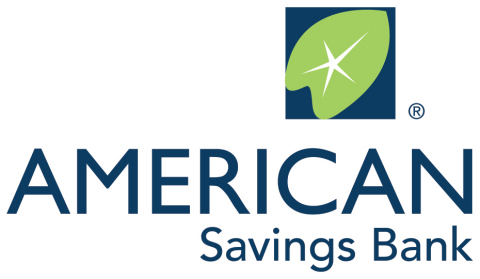 The Company completed an updated Section 382 study through July 31, 2011 and the results of this study showed that no ownership change within the meaning of the Code had occurred through July 31, 2011 that would limit the annual utilization of available tax attributes. The Company has evaluated the positive and negative evidence bearing upon the realization of its deferred tax assets and has established a valuation allowance of $325.56 million and $330.43 million as of July 31, 2014 and July 31, 2013, respectively, for such assets, which are comprised principally of net operating loss carryforwards, research and development credits and stock based compensation. The Reporting Persons have engaged, and intend to continue to engage, in discussions with the Issuer’s management and members of the Issuer’s Board of Directors (the “Board”) on multiple topics, including the Reporting Persons’ suggestion that the Issuer should revoke its Certificate of Dissolution filed with the Secretary of State of Delaware on March 7, 2013. Such discussions have also touched on corporate governance and corporate finance matters, including but not limited to the potential adoption of a shareholder rights plan, additional equity issuances, the use of net operating losses and other suggestions for maximizing shareholder value. The Issuer has not taken any action with respect to the Reporting Persons’ suggestions described above. The manager of General Holdings is Andrew Bellas, who was a partner at "Tiger Cub" firm Tiger Global Management where he specialized in technology stocks but left in January 2015 to start his own fund according to the Wall Street Journal. Some light Googling found that he had been rumored to take a job at Latimer Light Capital, but it's unclear if he took the job or if he just went solo with General Holdings. My guess is he could be looking to take control of Sycamore, put himself in charge and could use the shell as an acquisition vehicle. It's difficult to value NOLs, but even after the recent excitement in SCMR shares, the NOLs are only being valued at a $5-6MM, if the company were to switch strategies and somehow utilize the NOL, the company would be worth multiples of it's current value ($5-7 wouldn't be out of the question). Similar to WMIH, it's hard to point to a specific valuation as a shell, but with a 20% downside to $0.40 if the liquidation continues and a 10 bagger upside if it's reversed, the risk/reward seems worthy of a small position. NOL rules are fairly complex, Section 382 of the IRS code stipulates change of ownership rules around net operating loss carryforwards. I'm not a tax accountant, but I'd be curious if Andrew Bellas and his 14+% stake will limit the use of the NOLs going forward? Even if the NOLs were limited annually, it wouldn't be the end of the world, the $856MM NOL is so large that it would be difficult for Sycamore to utilize it quickly without a huge equity raise in the first place. Andrew Bellas and Lloyd Miller aren't the first investors to spot Sycamore's net operating losses, there have been others since it was clear the company was going down the liquidation path to push for a different strategy to utilize the valuable tax assets. I can't be certain if there are other roadblocks pushing the company toward liquidation versus NOL monetization, but at today's prices its worth a small tracker position that can be added to as the situation becomes clearer. I realize LiLAC has been covered plenty on Twitter and other blogs, but I just wanted to memorialize my thoughts along with some of those in our recent CFA Society Chicago's Special Situation Research Forum meeting. 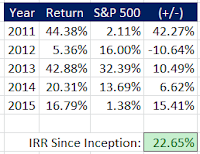 Others have provided far better financial models than I could create, so I'll focus more on the qualitative reasons why LiLAC is attractive and why the opportunity exists despite John Malone's track record. LiLAC Group is the tracking stock that began trading on 7/2/2015 to represent Liberty's Latin American and Caribbean ("LiLAC") Group assets. Liberty Global, is of course the John Malone controlled entity which sought to recreate the original TCI in international markets, that story is mostly complete in Europe now they're switching their roll-up focus to Latin America. LiLAC Group today is made up of two entities, 100% ownership in VTR (Chile's largest cable company and around 70% of LiLAC's revenue) and 60% ownership in Liberty Cablevision Puerto Rico which recently completed the purchase of Choice in June 2015. In total, LiLAC passes approximately 4 million homes, has 3.2 million RGUs off of 1.5 million customers. The accounting is muddied up enough as it is, so I'm going to discuss LiLAC without adjusting for the minority interest in Liberty Puerto Rico, in the end it doesn't make much difference. Liberty Global co-CFO Bernie Dvorak said at the annual meeting, "LiLAC tracking stock represents another milestone and we're eager to take advantage of this new structure to tap into further growth opportunities in the region." John Malone seems alone in having success with the tracking stock structure, it's rather rare at least in U.S. markets but it creates a potential acquisition currency, capital allocation flexibility and allow's management to highlight the value of a particular set of assets, all while keeping the tax and cost advantages of one balance sheet together under one corporate umbrella. The Latin American cable market is still relatively early in its development, much of the population doesn't have access to broadband, and much of those that do are covered by "mom and pop" type operators. Establishing the tracker gives Liberty Global a pure play currency to offer (LILAK, the non-voting C shares) to acquisition targets that may want to have continued exposure to cable growth story but be relieved of running the day to day operations. John Malone is famous for playing all aspects of the capital structure, most management teams focus primarily on the debt side, structuring their liabilities in such a way to minimize rates, recourse, covenants, etc, but few spend time optimizing the equity cost of capital like Malone. By creating the two tracking stocks, Liberty Global will be able to simultaneously buyback shares in LBTYA while issuing shares of LILA for acquisitions and more effectively manage each group's cost of capital than could be done with a spinoff. By maintaining the larger corporate entity there should be some cost savings, one management team spread out over a larger asset base, more leverage with vendors, greater balance sheet capacity. The primary downside being added complexity and if one group gets into financial trouble, it will drag the other with it since they're not formally separated. 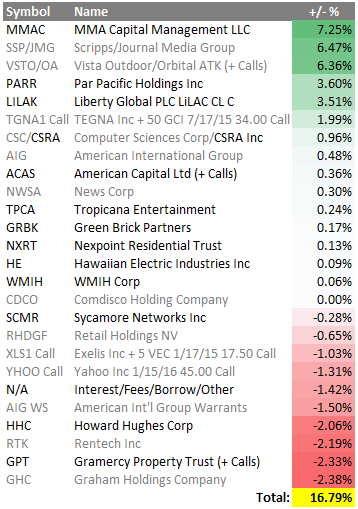 Thanks at least partially to the recent worldwide selloff, LiLAC is an absolute bargain today at roughly 7.0x a run-rate EBITDA inclusive of the Choice acquisition in Puerto Rico but without any credit given to potential M&A, comparable cable companies trade for 9-10x representing significant upside. 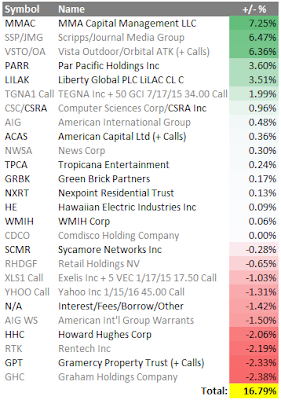 Even with a one turn discount for being a tracker to 8x, LILA/LILAK should be worth $44-45 per share. 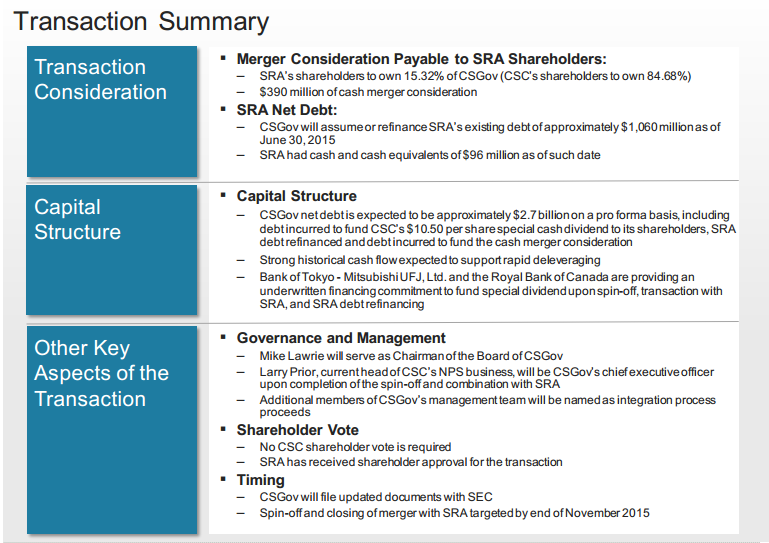 One question that I still have on the balance sheet, per the 10-Q: "On June 30, 2015, in order to provide liquidity to fund, among other things, ongoing operating costs and acquisitions of the LiLAC Group, a subsidiary attributed to the Liberty Global Group made a $100.0 million cash capital contribution to LiLAC Holdings" - Is this just an initial reattribution for the tracker spinoff or something else? It didn't appear in the initial S-4 or the LiLAC road show presentation. Also it clearly signals acquisitions coming soon as it doesn't appear VTR or Liberty Puerto Rico need the cash for their day-to-day operations. M&A, LiLAC has $467MM in liquidity and all signs point to management continuing the successful levered equity playbook by rolling-up Latin American assets using mostly debt; if you run a model assuming free cash flow gets directed toward M&A and their leverage ratios stay fairly constant you can quickly get to some 20-30% annualized returns. 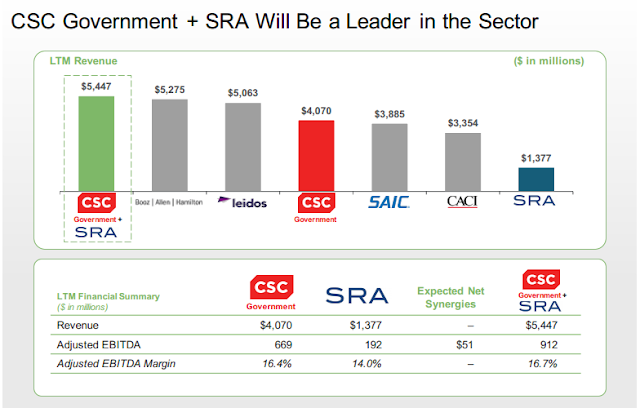 The June acquisition of Choice in Puerto Rico should provide both cost synergies and revenue growth opportunities since most of Choice's clients were primarily broadband only clients, there's an opportunity to up-sell them video and voice services. In the Q2 earnings presentation, management quoted a 3.5x net leverage ratio giving proforma effect for the Choice acquisition. I had a hard time squaring that number, but using a $2.1B net debt position, that means OCF is ~$600MM? Seems like they're projecting some significant growth from Choice. VTR Wireless - they currently only have a little more than 100,000 customers, or 1% of the market in Chile, but there should be some opportunity to cross sell and create a 4 play model (video, internet, land based voice, wireless) to increase RGUs. Eventual full spinoff once the LiLAC business matures, closes tracker discount, or Liberty Global could sell LiLAC to another industry consolidator like Altice or Cable & Wireless. LiLAC in typical Malone fashion is a heavily levered equity, does it work in countries with a high cost of capital? 70% of revenues are in Chilean Peso (remainder in USD - Puerto Rico) which is near 12 year lows against the dollar thanks the slide in commodities; VTR debt is in USD, but hedged into Chilean Pesos through 2021, the all in cost of the debt is 11.1%, management must expect strong growth to overcome that hurdle. If the dollar does begin to weaken, it could result in a significant tailwind when combined with mid-to-high single digit organic revenue growth. Chilean economy heavily tied to copper and natural resources, also in an earthquake zone with the potential to damage infrastructure type assets. Taxes are also rising in Chile on a laddered basis, topping out at 27% in 2018. Counter -- Chile enjoys the highest economic freedom in Latin America and the Caribbean (ranked 7th overall, ahead of the United States), generally viewed as the most modern Latin American country. Puerto Rico has well known economic problems, in default on debt, may face austerity measures. Counter -- as CEO Michael Fries is quick to point out, these are not new economic issues for Puerto Rico, LiLAC has been able to consistently grow through them despite the macro concerns. Malone has less than 3% economic stake in LiLAC, owns significantly more of CWC in region, any potential conflicts arise from that? Counter -- Cable & Wireless provides a natural acquisition partner, opportunity to fold one into the other. General technology disruption concerns: cord cutting, OTT, satellite providers, consumers might move down from triple play packages to just two services or down to just broadband. Competition for deals: Cable & Wireless, Digicel are active in region, Altice active everywhere, could drive up the price of M&A opportunities. Are there enough attractive acquisition targets in business friendly countries? Everyone knows John Malone's incredible record, spinoffs are popular and every event-driven analyst is trained to look at them, so why is LiLAC undervalued? Tracking stock complexity - as mentioned earlier, it's a rare type of security that many traditional managers aren't going to be interested in from the beginning; it's also unlikely to be in any indexes, doesn't pay a dividend, has a limited natural shareholder base. If the tracking stock doesn't work out, Liberty Global can either spin it out or fold it back into the parent company and close any tracker discount. Small size in relation to Liberty Global Group - shareholders of Liberty Global received 1 share of LILA/LILAK for every 20 shares of LBTYA/LBTYK owned, roughly in line with the size of the entities, LiLAC group is roughly 5-6% of the overall entity, creates some uneconomic selling as investors treat it like a special dividend and sell. Dislike for Emerging Markets - Latin American stocks are down roughly 50% from September primarily because of the region's emphasis on natural resources and the China bubble deflating reducing demand for commodities. South American countries have a reputation for being unfriendly to business and heavily corrupt. I ended up drinking the kool-aid and started a position on Wednesday around $33, made it a medium sized position that leaves some room to add if the sell-off continues. My head hurts after looking at this for the past two weeks, if one wants to invest in a Malone levered equity, buying Liberty Broadband is probably a much simpler way to do it, no currency risk, cheaper debt, and much cleaner financials. Mario Gabelli's GAMCO Investors (GBL) is spinning off their event driven alternative funds, research unit, and broker/dealer into a separate company dubbed Gabelli Securities Group (GSGI). 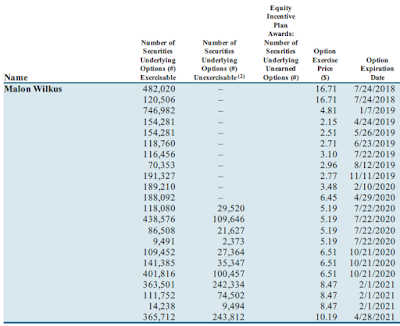 The larger GAMCO Investors has over $45B in AUM, much of it in retail mutual funds which are in secular decline, the event driven alternative fund business has about $1B in AUM, only a tiny fraction of the total and thus puts it on my radar for a potential post-spin dump. So why do this spin? Mario Gabelli is a good investor, a great marketer and asset gatherer, has a great brand name, and the event-driven space is a hot hedge fund category. I'd guess that Gabelli is going to put a disproportionate amount of weight behind selling the spinoff's products in the early going and increase AUM quickly. 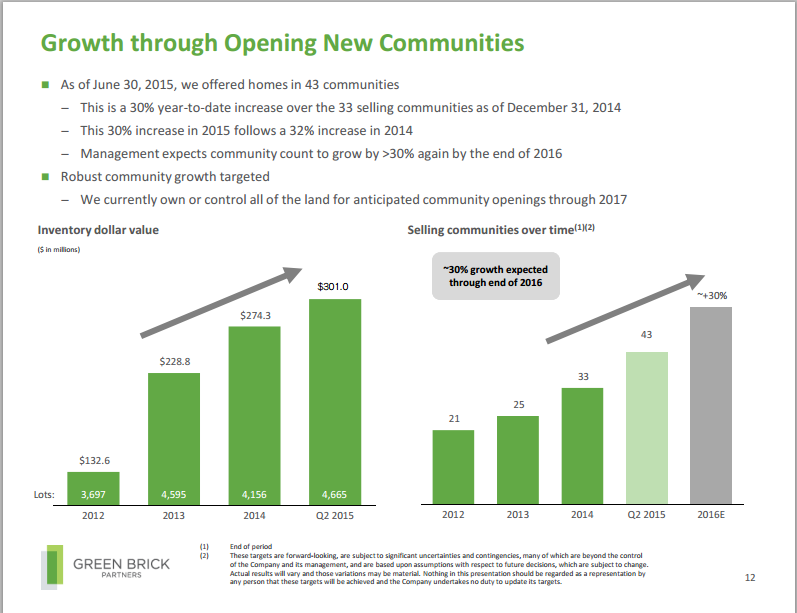 So this is a rare combination of a small spinoff that might get sold off by GBL shareholders, but is in fact the growth business of the two. Mario Gabelli will maintain his 10% royalty on pre-tax earnings of the new entity, and control the company via super-voting shares, so that will limit the upside, as you're effectively paying a hedge fund like fee to invest in his hedge fund management business. Hemisphere is the owner of the largest Puerto Rican local broadcast station, WAPA, and 5 Spanish language cable channels (Cinelatino, WAPA America, Pasiones, Centroamerica TV, Television Dominicana) that are typically contained within Spanish language add-on packages. Hemisphere has held up reasonably well in the overall cable content selloff. It's controlled by InterMedia, and went public through a reverse merger with a SPAC in 2013. The pitch behind Hemisphere is the young, growing, and underserved Hispanic population in the United States, plus they're pursuing adding advertising to their top cable channel Cinelatino (Spanish-language movie channel) that was previously advertising free. Hemisphere doesn't appear particularly cheap on the surface, trades at 12x EBITDA compared with larger U.S. cable television peers like DISCA, VIAB, SNI, and AMCX in the 8-10.5x range. But Hemisphere might deserve that premium as their subscriber counts are growing whereas most networks have seen reductions as cord cutting takes hold. Additionally, larger peer Univision has filed for IPO at a hefty implied $10B market cap, look for some of that enthusiasm to spill over into Hemisphere Media. Not value or a special situation, but an interesting growth name. National Beverage is all about the push into healthier/lifestyle focused beverages, mostly via their LaCroix sparkling water brand. In total they're the 5th largest carbonated beverage company in the United States with a market cap just under $1.2B. LaCroix is extremely hot, I can't log into Facebook without seeing pictures of someone trying out a new flavor or reading an article about the best LaCroix mixed cocktails. National Beverage also has legacy soda brands that you forgot existed like Shasta and Faygo, the plan appears to be to milk the cash flow from these sugary beverages and direct it to LaCroix and other growth brands. The company is family run, controlled by Nick Caporella (his son is the president) who owns 74% of the shares, making the float only $300MM or so and out of the range for a lot of institutional investors. The company's quarterly news releases read like a small town newspaper, and there are very limited financial disclosures in the 10-Qs or 10-Ks, so it's hard to really get a good picture of how the business is doing. But after Coca-Cola invested in both Monster and Green Mountain, why wouldn't they take a shot at the sparkling water leader too? I've been close to buying Newcastle several times this year, it's basically a forgotten stub after the Fortress controlled mREIT has spun-off three companies in the last 2-3 years - New Residential (NRZ), New Media (NEWM), and New Senior (SNR) - leaving a pool of legacy commercial mortgage loans/debt and a golf course management business behind. The quick thesis is the pool of debt securities is near term and liquid, it covers the entire market cap and you get the golf business for free. Fortress estimates the golf business will do $30-33MM in EBITDA in 2015, there's an easy public comparable in ClubCorp (MYCC) that trades for 10-11x EBITDA equaling ~$3.50 per share in value for NCT which trades just below $5. Golf may or may not be in secular decline, but it's another similar business to New Media or New Senior where it has a long run away of "mom and pop" type acquisition opportunities to create a mini roll-up. Wes Edens has also mentioned using ERP Properties as a model and diversify away from golf into other recreational real estate assets. The downside is of course Fortress, and their external management fees and conflicts, its always going to deserve some discount and you have to be careful using their investor presentations as your investment thesis. All private equity guys are great at spinning a story. Another company with a history of doing spins is Viad Corp, today it operates in two separate business lines, Marketing & Events Group (mostly conventions) and Travel & Recreation (hotels, lodges, adventure excursions), with no apparent synergies which will eventually lead to either a spin or sale of one of the businesses. The travel business operates in and around Banff/Jasper, Glacier National Park, and Denali National Park, it's a good but niche business catering to seasonal adventure travelers. The travel business does about $36MM in EBITDA annually, and would fit nicely into a travel and leisure portfolio like ERP or what NCT wants to build. If you back out the travel business at 10x EBITDA, the Events/Conventions business is being valued at just under 6x EBITDA (including $10MM of corporate overhead). Certainly cheap, but it's a cyclical business and a low margin one, it's on my long term watch list as something to return to coming out of a recession. Side Note: If you're located in Chicago, there's a good special situations/"10-K" group that will be discussing Liberty Global's LiLAC Group tracking stock on Monday at 3:30pm at the CFA Society Chicago's office at 124 N LaSalle, come join, and I'll post my thoughts on the name here sometime next week. A simple and brief investment idea today, it's been teased and mentioned a few times in earlier posts on other NOL companies. WMIH Corp (WMIH) is the remaining shell of the former subprime lender Washington Mutual which became the largest bank failure before most of its assets were sold via the FDIC to JPMorgan Chase in September 2008. What remains in the old corporate shell is approximately $6B in net operating losses, a small reinsurance business that's in runoff, and $600+MM in cash set aside for a future acquisition. KKR is effectively in control of the company via the $600MM convertible series B preferred stock issued in January of this year, the proceeds of which are in an escrow account. KKR is one of the original leveraged buyout shops and gives WMIH Corp access to deal flow and an experience management team. SPACs and "platform companies" are a current rage, add that with the M&A reputation of KKR and any WMIH acquisition could be met with investor enthusiasm. WMIH Corp has cash of $670MM to use for an acquisition, $600MM in escrow and $70MM at the corporate level (I'm ignoring the cash and investments inside the runoff reinsurance company). Let's assume KKR will just use the escrow funds and leave the $70MM for liquidity, they could make an acquisition using half equity, half debt for a $1.2B operating company generating $200MM in pre-tax earnings. Using a 10% discount rate and assuming 3% annual growth rate in the pre-tax earnings the NOL could be worth an NPV of ~$750MM. That's probably on the low side, 1) KKR will likely make a larger initial acquisition and raise capital via a rights offering (similar to GRBK, PARR, RELY) to bring forward the NOL value, and 2) there will be additional bolt-on acquisitions over time that will increase earnings at a faster clip than 3%. But to be conservative, let's use the $750MM value for the NOL. WMIH Corp has also granted warrants for 61.4 million shares at an average exercise price of $1.38 per share which will raise nearly $85MM. Add that with the $670MM in cash, plus the $750MM NPV of the NOL, totals $1.5B for WMIH. The current share count doesn't include the dilution of the various warrants and convertibles in WMIH Corp's capital structure. KKR's series B preferred stock will convert to equity at the time of an acquisition at a price of $2.25 creating 266,666,666 shares, add in the 1 million shares of Series A convertible preferred stock and the warrants will add another 61.4 million shares to the current outstanding 202.3 million, or a total of 531.4 million shares. Using the $1.5B valuation number, that works out to $2.82 per share versus about $2.50 today. So you're merely getting an okay deal today for the shell, but the incentives and potential leverage in an acquisition are such that there could be substantial value creation once a deal is commenced. KKR is unable to find a suitable acquisition, pays the wrong price, or just simply takes too long creating an opportunity cost for investors. At the time of an acquisition, there will probably a rights offering, so keep that in mind when sizing a position. Trading around deal announcement, rights offering, and deal closings have been extremely volatile in these NOL shells, so even when there is good news, could be a wild ride. Graham Holdings (GHC), formerly The Washington Post Company, has transformed in the past two years as they’ve sold their namesake publishing business to Jeff Bezos, completed an asset swap with Warren Buffett’s Berkshire Hathaway and most recently spun off of their Cable ONE (CABO) broadband business to shareholders. The Cable ONE spinoff came with a lot of attention as another round of consolidation happens in the cable space, it's basically assumed (and priced accordingly) that Cable ONE won't be independent for long. The spinoff has created an opportunity to buy the remaining Graham Holdings stub for an attractive, low-risk price. 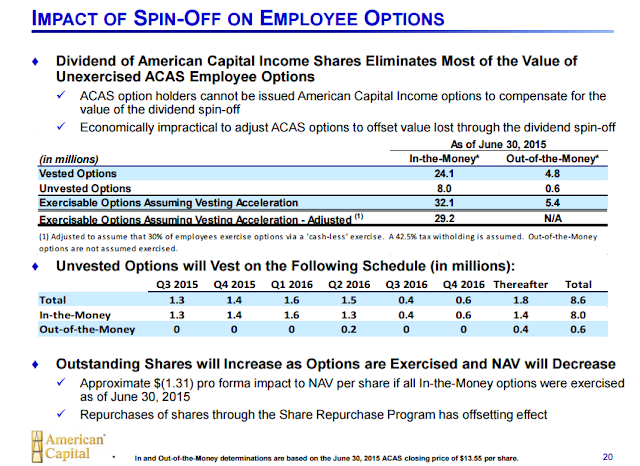 What remains is a cash and securities heavy balance sheet with a collection of diverse businesses including 5 television broadcast stations and for-profit educator Kaplan along with the largest overfunded pension plan in the Fortune 1000. Owner/operator Donald Graham and his family control the company and have filled the board with many respected investing minds including Thomas Gayner (Markel), Barry Diller (IAC, Expedia), and Chris Davis (Davis Select Advisors). Don Graham also has close relationships with Warren Buffet and was formerly on the board of Facebook giving him additional access to advice and deal flow. I'll break out the assets/business segments by easiest to the most difficult to value, but with a market cap of about $4.1 billion, an investor is roughly buying the cash, securities, discount pension asset and TV broadcasting segment while getting a nearly "free" option on Kaplan's turnaround, SocialCode's growth and a hodge podge of other businesses. After the spinoff of Cable ONE earlier this month, which paid a $450 million dividend back to the parent, Graham Holdings should have around $1.1 billion in cash (including restricted cash) plus $215 million in securities - backing out the $400 million in debt equals a net cash position of $917 million. If history holds, the company will use its recently increased share repurchase plan (659,219 shares or ~11% of the share count) to continue cannibalizing itself - the share count is down nearly 40% over the last 5 years. 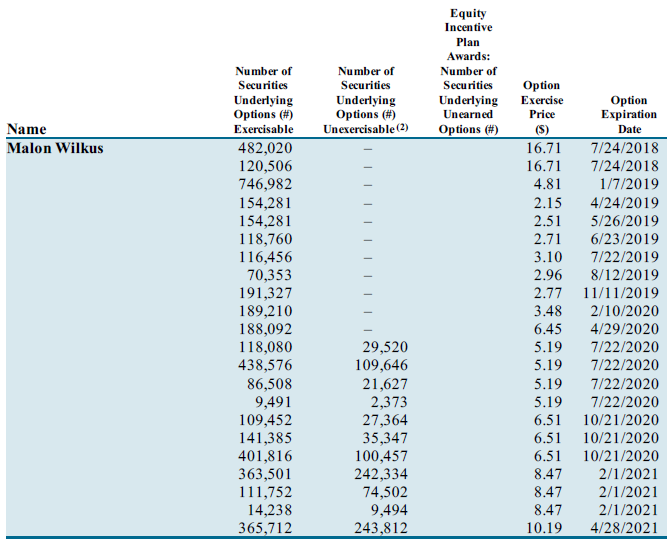 Graham Holdings enjoys the enviable position have having a massively overfunded pension plan, most know the back story of a younger Warren Buffet purchasing shares of The Washington Post Company in the 1970s and convincing Katherine Graham to shun the traditional pension plan asset allocation model and instead invest in a heavily concentrated portfolio, including a big slug of Berkshire Hathaway. That advice proved valuable and now Graham Holdings is sitting on a $1.15 billion prepaid pension asset on its balance sheet. While its difficult to monetize such an asset, it does give Graham Holdings flexibility and potentially could lower its cost of capital when continuing to acquire smaller industrial companies that may have legacy unfunded pension liabilities. 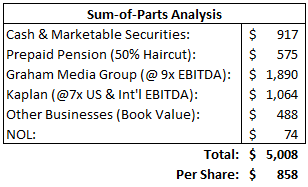 For the purposes of a sum of the part analysis, I'll apply a 50% haircut to pension asset, or $575 million. The company owns five local television broadcasting stations located in Houston (NBC), Detroit (NBC), Orlando (CBS), San Antonio (ABC), and Jacksonville (Independent). I've spent some time this year on other broadcasting companies, it's a fairly stable high margin business with several tailwinds (2016 elections, spectrum auctions). There are plenty of pure play public comparables and its a segment I could see Graham spinning off in similar fashion as Cable ONE. There is a lot of consolidation activity happening in the broadcast space and a spinoff would allow for a tax efficient sale of the business unit. Graham Media Group will do about $210MM in blended '15/'16 EBITDA, putting a 9x multiple on that fetches a $1.9 billion valuation. The most controversial of Graham's business lines is the for-profit education segment, Kaplan, which makes up the bulk of the post-cable spin revenues but comparably a much smaller piece of the profit and current value. The for-profit education sector is a hated one, and a lot of that is for good reason, many in the industry are simply diploma mills that use aggressive marketing to appeal to low income students who are easily taken advantage of and rely almost exclusively on government guaranteed student loans to fund their tuition. Many don't finish school and end up with hefty loan payments and no degree, those that do finish, end up with a degree of questionable value and limited job prospects. Kaplan's business is broken up into three segments: Kaplan Higher Education (US based online university and professional education prep), Kaplan Test Prep (SAT, ACT, MCAT, GMAT, etc), and Kaplan International (a growing diverse set of businesses across mostly developed countries). The US business is under tremendous stress as enrollment numbers have been cut in half over the last five years. The business is a potential turnaround, it has sold its physical locations to focus primarily on the online market, and with the job market picking up, sentiment and job placement numbers should improve, the for-profit space is a highly cyclical business coming out of a deep trough. Turnarounds in the public markets are extremely difficult as investors/analysts focus on quarter to quarter results. As part of Graham, Kaplan's results are slightly hidden from view allowing them to take a longer term view in the face of increasing regulations. In the 2014 annual letter, Don Graham makes the case that increased regulation might have a positive effect on Kaplan by taking out the bad eggs/weaker players in the market and increasing the barriers for new entrants. Politically, the for-profit sector has a place as its going to be too difficult for any politician to take a firm stance against expanding college accessibility (and loans) to low income students. Kaplan's name hasn't been as tarnished as others and with the backing of a strong holding company should be able to survive to see the light at the end of the tunnel. Public comparables for Kaplan are all over the place, but with a blended EBITDA of $152MM across the three business segments, I'd argue it's worth at least 7x EBITDA, or $1.06 billion, with some upside to the multiple and EBITDA as earnings normalize across the industry. SocialCode: The most promising of the other business is SocialCode which describes itself as a social media marketing technology company that helps companies manage social advertising on platforms like Facebook, Twitter, LinkedIn and Instagram. In the 2014 annual letter - stated it's now "significant to our company". With social media companies ramping up the monetization of their platforms with advertising, SocialCode could be in a position to take advantage of that advertising dollar shift. Don Graham's daughter is the founder and CEO of the company; The Washington Post did an interesting story on the company in late 2014 - they have 25% gross profit margins and over $300MM in revenue, given private market valuations for technology startups SocialCode has some upside optionality via a sale or spinoff, a nice option that I just wouldn't want to pay up for. Trove: This segment is a news aggregator app similar to Flipbook where you can pick and choose news topics you're interested in, I've been playing around with it the last few days and it doesn't appear too useful. I'll look for a topic I'm interested in, say a sports team, and a very generic "Trove" exists with dated articles. It's hard to tell what the revenue model is as well and how scalable that is for a company the size of Graham? Maybe it's higher quality than I'm giving it credit for; again SocialCode and Trove would likely be a lot more valuable as private startups given today's frenzy in that market. The Slate Group, The FP Group: These are two online magazines, Slate is moving its content behind a paywall and having reasonable success but its hard to make money in the online publishing world. Both are nice properties, but probably not worth a whole lot. Celtic Healthcare, Residential Healthcare: Celtic and Residential both provide home health care and hospice services. Given the aging demographics of the United States and the "mom and pop" nature of senior and home health care, there's an opportunity to roll up smaller players and make this a larger business. Forney Corporation: An industrial company that makes safety related equipment for power plants that Graham acquired in 2013 from United Technologies. Since then they've done a few bolt on acquisitions with Forney including Damper Design and FlameHawk in 2014. Seems like a nice small business (potentially insignificant) but we don't have much information on its profitability or how it really fits with the rest of Graham Holdings. Joyce/Dayton Corp: Another small industrial company that Graham recently purchased, Joyce/Dayton manufactures screw jacks, linear actuators, and the like for the energy, metal and mining sectors. What's the bigger picture with these two industrial companies? On the one hand Graham is selling and spinning off major business segments but collecting smaller ones under the Berkshire decentralized holding company management haven philosophy. Graham's financial disclosures aren't the best, all of these businesses are grouped together making them hard to value separately (maybe now that Cable ONE has been spun out and SocialCode is "significant", it will become its own reporting segment). To be extra conservative, I'll use the book value of the assets of the "other category" in the latest 10-Q of $488 million. Graham Holdings also has a small deferred tax asset, given their past tax savvy moves I'm comfortable using the full $74 million valuation allowance. I come up with a value of $858 per share, which I consider a fairly conservative valuation depending how you choose to value SocialCode and the other businesses. Conglomerate/Controlled Discount: Until recently Graham Holdings wasn't concerned about conducting transactions that would expose value, but after a busy two years, will the deals now slow down? We also haven't really seen what Tim O'Shaughnessy's capital allocation acumen is like since they haven't done a deal since he's come on board in late 2014. Conglomerates deserve some discount, I feel like that should be adequately accounted for in my estimates. Graham Holdings also has a dual share class structure with the class A shares in the hands of the Graham family and having 10-1 voting rights. Nepotism: Donald Graham is a former DC police offer, now heads the company his mother once controlled, late last year he appointed his son-in-law, O'Shaughnessy (founder of LivingSocial), to be the President. For-Profit Education Stink: It's a hated industry, and what Graham Holdings is primarily known for now, but if you zero out the value of Kaplan completely, you simply have a fairly valued company. The downside seems pretty limited, the company will be in the market buying back shares and you have a BoD and management squarely focused on increasing shareholder value. Graham Holdings has run up a little since the spin, I bought it on the day it started trading regular way (7/1/15), but I think it has upside from here and have the intention of making it a core long term position.